For over 50 years the Print Council of Australia has invited contemporary artists to create new editions of original prints on an annual basis, which are then allocated to subscribers and acquired by collections. This raises funds for the organisation, while fostering the creation of new work in print media and promoting the development of Australian printmaking. Each year the Print Council of Australia commissions Australian and New Zealand artists from an open call for submissions to create a new, original limited print edition for the PCA Print Commission. The PCA Print Commission provides a major promotional and professional development opportunity for the selected artists. Two independent arts professionals judge entries and select the final group of prints to be commissioned. The selected artists produce a limited edition of between 30-40 prints in their chosen medium. Prints become part of significant public and private collections throughout the country, as many public galleries and museums acquire the prints on an annual basis for their collections. A set of the prints from each year’s commission enters the PCA Print Archive Collection commenced in 1967, the State Library Victoria collection. The Print Commission is featured in the September issue of IMPRINT magazine and exhibited at interstate in gallery venues around Australia. Subscribers can select which prints they would like from that year’s collection. The prints are also available for purchase at PCA member and non-member rates. The applications are collated and sent for shortlisting by independent judges. Shortlisted artists produce a bon á tirer proof (or working drawings if the medium precludes this) of an entirely new print and judges make their final selection. The artists selected for the commission each produce seven artist proofs and an edition of between 30 and 40 prints for distribution to subscribers. Artist proofs are exhibited at interstate galleries and are returned to the artists at the conclusion of the exhibition. Selected artists each receive a supply of 50 sheets of quality printmaking paper for editioning. PCA pay an artist’s fee of $700 (plus GST) to each selected artist. Contractual details for 2019 will be provided on the Conditions and Agreement form forwarded to selected artists. Non PCA members are welcome to apply. Artists chosen for the Commission will be required to join the PCA. Artists who have been commissioned in the PCA Print Commission program previously are ineligible to apply within 2 years from the year they were commissioned. 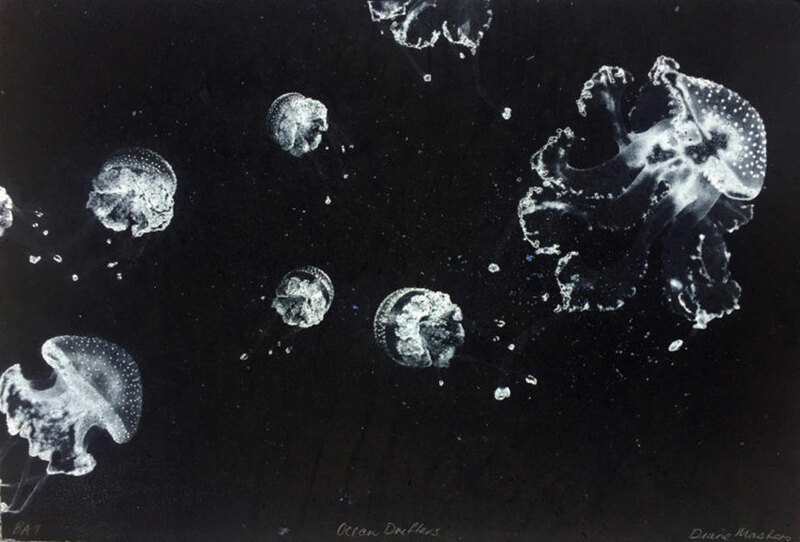 IMAGE: Diane Masters, Ocean Drifters, carborundum and solar plate etching. PCA Print Commission 2017. Entries for the PCA Print Commission 2019 will be open from 16 December 2018. For any queries please visit our application page after this date or contact the Print Council of Australia on 03 9416 0150.